There are multiple ways to convert RTF to PDF and edit PDF author. 1. Normally, you can convert RTF to PDF first, and then edit PDF author. 1.1 Convert RTF to PDF: It’s easy to convert RTF to PDF. The following are two ways to convert RTF to PDF. a. Google “RTF to PDF” on the internet, you can find a lot of free document converters that may help you convert RTF to PDF. b. 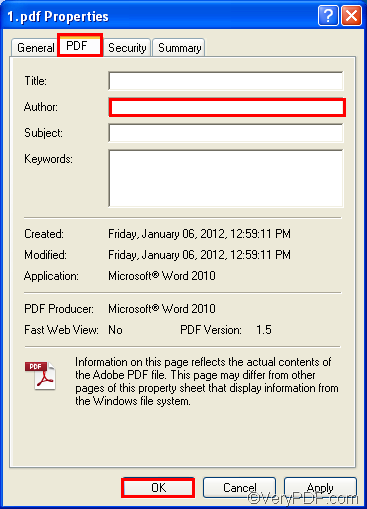 Or if you have Office 2010, you can use Word 2010 to convert RTF to PDF, just do as follows: use Word 2010 to open the RTF file, > click File, >click Save As to open the Save As dialog box, >In the Save As dialog box, select PDF in the Save as type combo box, > click Save. 1.2. Edit PDF author: After you create a PDF file from a RTF file, you can edit PDF author as follows: right click the icon of the PDF file, > click Properties to open the Properties dialog box, > click the tab PDF, > edit PDF author in the Author edit box,> click OK. However, if you don’t have any Adobe product, it may be difficult to edit PDF author. If you want to convert many RTF files to PDF, the above methods may require much time. So, if you don’t have any Adobe product on your computer, if you don’t want to open the RTF file or files, if you want to convert RTF to PDF and edit PDF author in batch, you are going to need VeryPDF HTML Converter Command Line. 2. The most effective way is to use VeryPDF HTML Converter Command Line to help you convert RTF to PDF and edit PDF author. Three steps are required. 2.1. Click VeryPDF HTML Converter Command Line to download it. 2.2. Open the command prompt window: Click Start, > click Run to open the Run dialog box, > type cmd, > click OK.
-author " rtf2pdf " is the option that can be used to edit PDF author. rtf2pdf is defined as PDF author. c:\in.rtf represents the input RTF file on disk C.
After you type a command line, please press Enter. How to set the margin and convert RTF to PDF? This entry was posted in HTML Converter (htmltools) and tagged command line, rtf to pdf. Bookmark the permalink.